No work on the altered book to report, but do have two new paint boxes - one is a 10-shade MicaColor watercolor palette in "Metallic." Included are colors such as misty lavender, spring green, macro pearl, and super russet. The paint absolutely GLOWS against either light or dark surfaces and I am hooked!! Unfortunately, an ordinary photo just doesn't do justice to the shimmering effects produced. The other goodie in my tool box is a panel of 7 metallic rub-ons. These are a creamy paste product applied with a finger-tip, that adds an opaque gleam to both porous and non-porous surfaces. Wonderful for highlights on polymer clay or art foam, and works on paper, too. I'm crazy for clear, bright colors and mostly, I believe in SPARKLE! Some say it is the gypsy in me.... The rage for collage and ATC's seems to be the vintage look, but when I saw these glam glimmer products, I knew I had to have them! 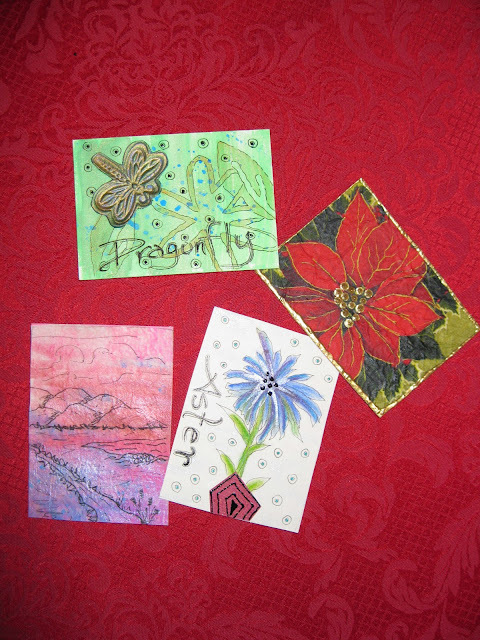 Eager to play, I made a few ATC's and here they are. The little landscape was painted on paper-cloth (a la Kelli Perkins) using only the metallic watercolors plus a dab here and there of the new rub-on metallic blue. I drew the scene using a Micron 005 pen. The dragonfly is a piece of embossed art foam and was buffed with both gold and green rub-on paste. The poinsettia is a piece of a cocktail napkin used to make paper-cloth. It's rubbed with a bit of gold and has fabric paint dots. The aster looks a little blah here, but the blues are very vibrant and the shimmery center looks like early morning dew. Sparkle and shimmer are my guilty pleasures too! Great ATC's, I particularly like the dragonfly one. These new paints sound yummy! I have those rubons in many different colors - love using them for some shimmer. Great ATC's, Ann. Love the ATC's Ann, expecially the poinsetta! Awesome job!! Sounds like your having fun with your new paints.